> Epicor > Are You A Future-Ready Manufacturer? Are You A Future-Ready Manufacturer? For manufacturers, staying competitive is critical to success. Technologies and trends are having a profound impact on manufacturing all around the globe. To take advantage of the challenges and opportunities that come with manufacturing in the global economy of the future; technology and automation must be a critical focus. Tomorrow’s manufacturer needs to be a leader when it comes to adopting technology. The future-proof manufacturer will be able to provide highly personal, flexible products where and when the buyer needs them, versus large quantities of homogeneous products. Increased connectivity between devices and consumer products opens wide the opportunity to gain market share. 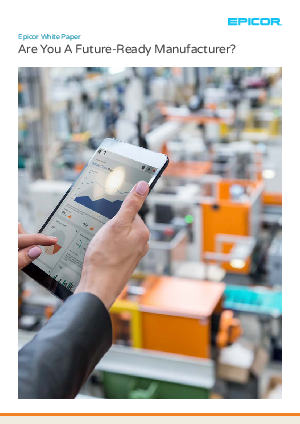 Download our Whitepaper and learn how to run the Factory of the Future by shedding any lingering habits of waiting for a new technology to become the norm before embracing it.